If you use apps and take a lot of pictures and video, you may find the your iPhone storage becomes depleted. This will prevent you from taking pictures, installing new apps and even upgrading your IOS software. There is a new capability in IOS 11 that will automatically offload apps that are unused and restore the storage that they use. Best of all it is easy and will happen automatically once setup. In the Settings app, scroll down and tap General and iPhone Storage. The screen to the right appears. The Check mark next to the setting identifies that the feature is turned on. This setting will remove the apps that you don’t use but will leave the data/document associated with the app. 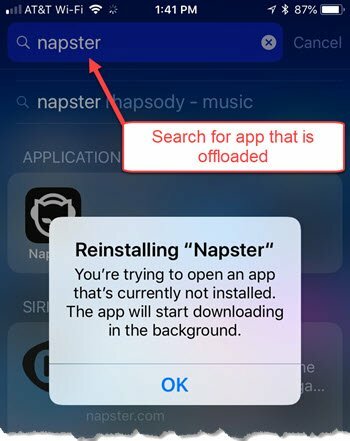 If you need to use the app later, you can search for the app using Search (See Nugget N-3) and your iPhone will reinstall the app with the following message. Senior Tech Club Recipe #123 – How to manage Storage on the iPhone.